After playing with the Symbian UIQ operating system for smart phones, Sony Ericsson at this time step is slightly different. This vendor has just released a new series of Xperia X1 with the Microsoft operating system, Windows Mobile 6.1. With stock, the Xperia X1 this may simply have a lot of sophisticated features. Features such as HSDPA, bluetooth, built-in camera, music player, Wi-Fi, A-GPS to complete the Sony Ericsson Xperia X1 Arc slider design with this. Sony Ericsson Xperia navigation is also complete. It's responsive touch screen on the touch of a finger or stylus pen. 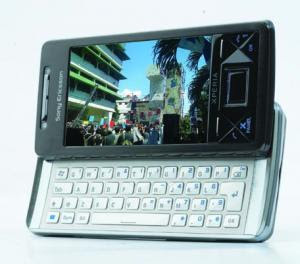 When the phone drawn to the right, appears with a QWERTY keyboard projection silver color, the color contrast with the phone. Key keyboard is designed such a way so that the fingers while making them comfortable. Another keypad that is unique in this series is the key to the panel directly on the bottom of the screen. Once the press, the menu will be present in the mobile phone panel that we want to display on the home page, such as direct access to Google Search and FM Radio. The view that the prominent series of Sony Ericsson Xperia X1 is the width of the screen. The screen size 40 x 51 mm or with a 3 inch diagonal size effects give comfort when in view. Not only that, with a screen resolution of 800 x 480 pixels, making the screen appear more clear, clear, and sharp. Although a large resolution, the Xperia X1 technology 65 thousand color TFT notabene that is not the most powerful at this time. Entertainment music lovers can be consoled with the music player and FM radio. Available for the music player features a default Windows Mobile Media Player to listen to favorite music. X1 provides a hole 3.5 mm standard audio so that when we want to make it easier to enjoy music or hear your favorite FM radio broadcasts using the stereo headset as you wish. A voice from the music player or FM radio is a maximum when we use the headset than the speaker. What, the speakers are on the bottom of the palm is closed sometimes when we are holding the phone. As the premium mobile phone, it is not complete if you do not bring the camera's built-in. Sony Ericsson X1 provide 3.2 Mpix camera with flash plus. Indeed, the resolution of the camera and the quality is not the highest at this time. But the treat menu that is quite complete, such as macro mode and auto focus makes it able to meet the needs of photography facilities. This camera also functions as a video recorder with a speed of 30 fps (frames per second). Features include a pledge to be the most in this series. With the provision of access can vary-7.2 Mbps via HSDPA or Wi-Fi 802.11 b/g- able to get internet access turbo. Support services to the internet thanks to this increased availability of Opera 9.5 browser - IE outside the Mobile-capable, and the standard so that the full HTML site in the mobile phone that looks exactly like the computer.